Texas – A Dallas/Ft. Worth Garden Ridge big box store experienced severe settlement inside their facility, creating a hazard for customers and store valuables, in addition to a declining asset value with the condition of the store’s concrete floors. Numerous locations inside the store experienced severe settlement, some locations up to 8″ of sunken concrete around the support columns inside the store. Customers reported that in particular areas of the store, their shopping carts would roll off if they were not holding on the cart. In addition to shopping carts straying, store racks became a potential liability hazard because of uneven concrete floors. Store managers were concerned with losing daily revenue and customers due to extensive concrete repair work that would be associated with breaking out the sunken portions of the concrete floor. 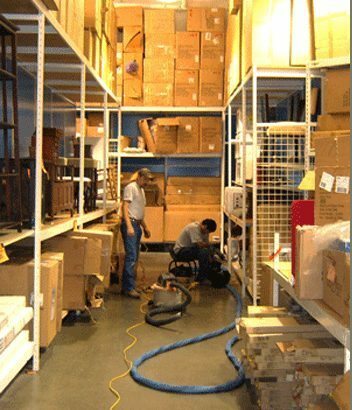 Merchandise racks and relocation of products to accommodate repairs would cause complete loss of use for the area in the store with high probability of the store having to experience a complete shutdown to re-pour concrete in the troubled areas. Due to the potential of daily revenue loss associated with a long, debris filled, break out and repour plan, store managers consulted Childress Engineering (Richardson, TX) to assist with repair recommendations, and Alpha Testing (D/FW) to provide the geotechnical investigation. Store managers sought a repair process that would be a long lasting solution, with minimal downtime for the store during the repair, and economical keep the store’s repair budget in line with the repair costs. URETEK’s concrete raising solution does not require relocation of stock or shelves or shutdown to the store and it’s occupied spaces. No dirt, debris, or jackhammers are used to disrupt store operations and customers. URETEK’s structural grade structural polymer reaches 90% strength in 30 minutes, allowing operators to move quickly from spot to spot, with minimal disruption to the store. The patented structural polymers are highly controllable, allowing operators to raise concrete to specified levels accurately, and quickly. Injections are made through very small, 5/8″ (penny-size) holes, reducing further weakening of the concrete foundation. URETEK ICR North Texas took 6 days to complete the concrete repair, all during business hours, allowing the store to stay open during the repair. URETEK ICR North Texas is a well-known specialty contractor in Dallas/Ft. Worth and surrounding regions. For over 10 years it has held the exclusive license for the patented URETEK® processes which utilize specially-formulated structural grade polymer to meet the challenges of concrete lifting, soil reinforcement and stabilization. URETEK’s repair was a fraction of the time it would have taken to completely break out and repour the areas of sunken concrete. Lastly, URETEK ICR’s repair costs came in $42,000 under budget of what was budgeted for the repair.